New book, 392 pages. This book looks at the people and events that brought wrenching, often enduring, and always bloody change to countries and societies. 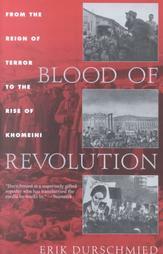 Covering the French Revolution, Mexico 1910, Russia 1917, Japan 1945, the Cuban Revolution, and the Iranian Revolution, the author contends that each had its own dynamic and memorable case of characters, but all too often the end result was the same: mayhem, betrayal, and death.